We all want a well-adjusted puppy that is a pleasure to be around, and who enjoys spending time with people. 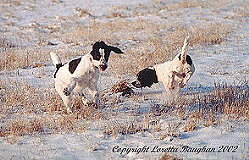 Ideally, most folks want their spaniel pup to be a wonderful companion in the field and, likewise, in the home. So how does one go about finding and raising a sociable spaniel pup? The importance of socialization in the healthy development of young puppies should not be underestimated. The process of puppy socialization ought to begin at the breeder's - right from day one. Puppies need human contact. Ideally, they should be handled by a person - stroked, caressed, and spoken to - on a daily basis. This early contact helps the puppies to view people as a source of security and pleasure. Very importantly, it serves to cultivate the pups' desire and ability to form a successful bond with their owners. Additionally, breeders who can provide the opportunity for their puppies to spend some time in a home environment allow for them to become accustomed to household sights, sounds, smells and activities. This enables them to make the adjustment to their new homes and families with greater ease. As the pups grow, exposure to new experiences, locations, and people are invaluable. Once the litter is about five weeks old, weather permitting, they should have the opportunity to explore the outdoors. Short walks into a field, along the edge of woodlands, plenty of playtimes in the yard, rides in an automobile and similar varied activities will encourage the young pup's natural curiosity and its acceptance for new experiences. New owners should continue this practice in the context of being fun walks enjoyed together. "The importance of socialization in the healthy development of young puppies should not be underestimated." Before you make the decision to add a spaniel to your household, it is best that a person examines their expectations for the pup, their lifestyle requirements, and the planned living arrangements. Do your homework. Read books and magazines; speak to a veterinarian, other spaniel owners and various breeders. Spaniel Journal has a commitment to providing informative articles and book reviews that should be invaluable during this process and beyond. Be sure to check the archives for additional reading material from past issues. Become well informed. Educate yourself about any specific health problems identified within the individual breeds under consideration. Once you've decided on a breed of spaniel, familiarize yourself with the various kennel names and titles you can expect to see in pedigrees. Know the difference between field trial, hunt test, obedience, agility, working dog, and show titles. Be aware of the various registration entities such as: AKC [American Kennel Club], CKC [Canadian Kennel Club], UKC [United Kennel Club] - that are typical of spaniels in North America. The Kennel Club UK, Irish Kennel Club, Australian Kennel Club, or similar organizations keep registries and award titles to spaniels found in other regions. In our global economy, it is not uncommon to find spaniels that have been imported from overseas.